Alias of Konrad Svetly Lezak 14. 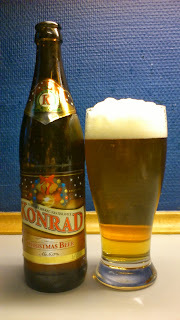 First Christmas beer of the season…..ok, I lied, I've had a tuborg which is absolute rank and not worth bothering about. So here we have a Czech offering but it is a bit of cheeky name change to suit the local market as it is really the alias above, naughty naughty ! In reality, this is just a strong Czech pils and I don't expect much festive season from it…..
Not much in the aroma department from the pour apart from some malt and caramel. This pours clear amber gold with a fluffy white head. Sweet burnt caramel prominent on the intake with malt, grass and honey in the background leading to a metallic bitter finish. Caramel and honey linger in the aftertaste. Softly carbonated with a light mouthfeel, not watery. Excuse my french but I thought this was piss poor for a Christmas beer, but it is an okay or should I say average strong czech pils. A bit too much honey and metallic notes for my liking but you can of course bypass the flavours by chilling the crap out of it and drinking near ice cold. Not the greatest start to my own christmas beer season but I'm sure there is some new for me duffers to try and gems to be found. Summing up, avoid if looking for a christmas beer. This scored 3/10 on the 'There's a few mugs up north, let's change the label' Beerometer.